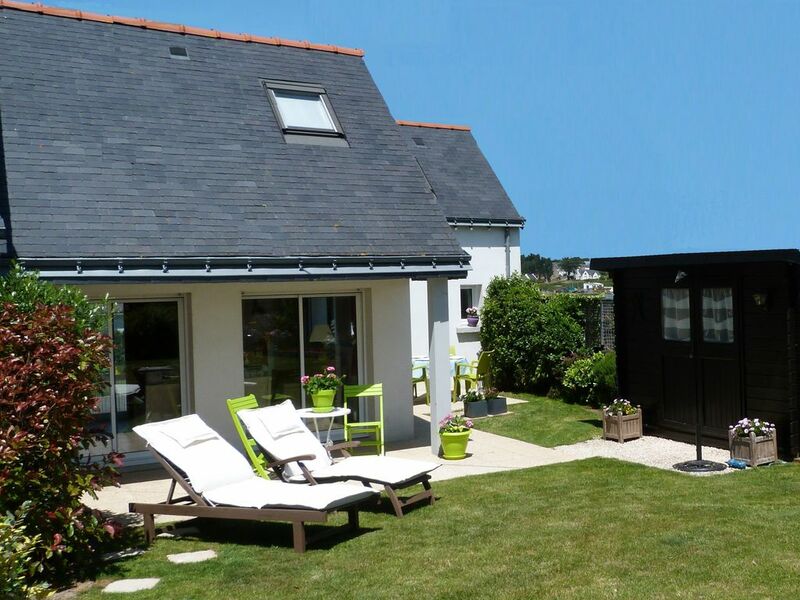 CARNAC-beach: cottage edge of the sea in a haven of peace. 2 bedroom cottage (sleeps 4). In the Po, near the charming village of St Colomban, gite of 50m ², sea view, gite adjoining the owner's house. On the ground floor: kitchen, bathroom, toilet, living room, and upstairs: a bedroom with a double bed and a bedroom with two single lilies. Tastefully decorated. South facing terrace with sun beds, table and chairs, barbecue. Private garden, closed parking, shared with the owner. for a single vehicle. Welcome gift. Rentals are from Saturday to Saturday 10h 16h. 1 week minimum. Beds are made on arrival (linens provided). Towels and table linen and cleaning products are provided. Dishwasher. Washing machine. Baby-phone. Iron and ironing board, hairdryer. Television. Microwave, oven, refrigerator, freezer, gas hob, utensils needed for meal preparation. Beach chairs and umbrellas available. Animal, availability: ask the owner. Deposit: 200 € to pay on arrival. Only 1 parking space. - The minimum of maintenance is provided. A beautiful location, peaceful, in easy reach of coastal beaches and towns. A lovely location, very nice helpful hosts. Coastline is dramatic and interesting. Plenty of places to visit the market in Carnac is large and is a "must do". Accommodation was just what we wanted with a secluded garden and sea views to the front, beach 5 minutes away with another one 10 minutes, both good. All in all a highly enjoyable week. Well done Vony et Didier thank you !!!!! Beau gite proche de la mer que l on voit du 1er etage. Jardin avec barbecue et de nombreux transats bien pratiques . La literie est neuve et les couettes bien moilleuses. Merci pour l accueil avec du cidre et des gateaux bretons. Et juste à coté de la maison un pruducteur d huitres Cochennen et de fruits de mer. Nous avons passé 2 belles semaines dans cette jolie location qui est conforme au descriptif de l'annonce. L'accueil a été des plus chaleureux par les propriétaires, maison très propre, au calme et tout est à disposition, il ne manque rien. juste a coté, ce qui a mes yeux est un plus (intimité assurée). Un grand merci a Vony et Didier pour leur gentillesse. Je conseille fortement cette location. A bientôt peut-être.....Les ch'tis Flo, Gégé, Jojo, Nathan, et Jack. Wer die Ruhe , etwas vom Strandtrubel entfernt , genießen will , ist hier am richtigen Ort . Das Haus ist sehr gut ausgestattet , sehr sauber und es wurde für den Start bestens gesorgt ( Betten bezogen , sämtliche Tücher zur Verfügung , Putz-Waschmittel liegen bereit , etc..). Der uneinsehbare blühende Garten mit Verweilecken , weiß man zu schätzen . Der durch ein elektrisches Tor gesicherte Parkplatz ist zu erwähnen . Die netten , zurückhaltenden Besitzer sind hilfsbereit und gastfreundlich . Sehr gute Note für diesen kleinen Gîte . CARNAC-plage: (do not hesitate to call us at O297528545 or 06 25254176, person didier@gmail.com (personpointdidierarobasegmailpointcom) for availability or other information). Seaside resort known for its preserved environment. Perfectly sheltered, the beaches of Carnac are appreciated by all the family for their fine sand, their gentle slopes, their invigorating and clear waters. Exceptional natural heritage, Carnac coastline is preserved. Légenèse, Ti Bihan, the Men Du, St Columba, the great beach ... These evocative names invite rest and relaxation. The nearest is 400 m. CARNAC-beach you will find shops, thalassotherapy, .the Casino, the yacht club and sailing school, restaurants. Carnac the menhirs is obviously! The largest megalithic site in the world to discover! The golf-PLOEMEL Carnac is 14 kms. Trinidad-sur-Mer is 5 kms away. Tourist Office of Carnac: 02 97 52 13 52 and http: // www. ot-Carnac. en /. Arrivée à partir de 16 h le samedi après-midi et départ au plus tard 10 h le samedi matin. CAUTION : 200 € à payer à l'arrivée dans le gîte. option nettoyage lors du départ : 60 € La taxe de séjour est incluse dans le prix.